LAST MINUTE CANCELLATION: UNFORTUNATELY DUE TO ILLNESS, THE DUO HAD TO CANCEL TONIGHT'S PERFORMANCE. THEY PROMISE A RETURN DATE, BUT AS OF TONIGHT NO FUTURE EVENT HAS BEEN SCHEDULED. THANKS FOR YOUR UNDERSTANDING AND CONTINUED SUPPORT OF BRIDGE STREET LIVE. Seeing Christine Lavin or Don White is a treat. Seeing Christine Lavin and Don White is an experience. Between the two of them, they have more than 40 years of combined experience making music and laughter. The Lavin/White co-bills have packed audiences in wherever they’ve played, from the Regent Theatre in Boston to The Ark in Ann Arbor Michigan. Audiences get a one-hour shot of each performer during their solo sets, and then a free-for-all when White and Lavin take the stage together and display the kind of chemistry you get from old friends and seasoned performers. You’ll never see the same show twice. 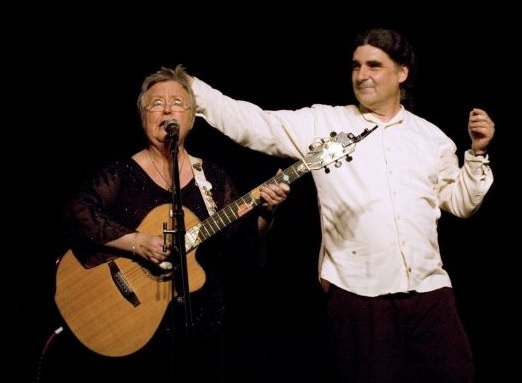 Christine Lavin is a multi-award winning singer-songwriter, author, and knitter. She released her memoir, Cold Pizza for Breakfast: A Mem-wha? ?, in 2010. She is also a founding member of the popular folk collective, The Four Bitchin’ Babes. White just released Winning Streak, his first studio album since 2003. He is a celebrated singer/songwriter/storyteller who has released eight albums and two DVDs. His book, Memoirs Of A C Student, is available in print and for the Kindle and Nook. Lavin and White have also released a digital only live album, Live At the Ark: The Father’s Day Concert.